How long does it take for people to forget about your past? Apparently, for some, it takes longer than 14 years. 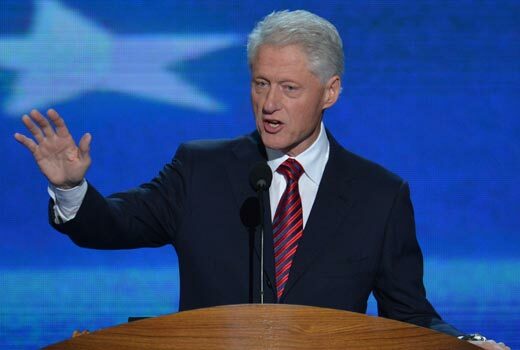 On Wednesday night, former president Bill Clinton spoke at the Democratic National Convention. He addressed the crowd with an honest, straightforward approach. However, many people found it difficult to believe him. On social media such as Twitter, people were arguing that they could not trust things coming out of Clinton’s mouth due to his dishonest past. Twitter users were using the hash tag #slickwilly to discuss his forty-nine minute speech. People on Twitter posted “Bill Clinton, a.k.a #SlickWilly was disbarred for lying..Not a word he says can ever be trusted..” and “May I remind you that this is a man who was impeached by the House of Reps for perjury and obstruction of Justice? #Clinton #SlickWilly.” These tweets were just a few of the negative words being spread across social media. There were, however, just as many positive remarks concerning Clinton’s speech as there were negative on twitter September 5th. Clinton has been branded by a group of U.S. citizens as dishonest. For this reason, the many facts that were included in Clinton’s speech have been meticulously checked. Although none of them have been found as incorrect, he has been critiqued for exaggerating many facts. The facts Clinton presented that have been questioned were his statements about the health care reform, Medicare, and the American Recovery Act. Clinton’s speech is the only one that has been carefully examined for not providing the whole story to back his “honest” claims. None of the many speakers at the Republican National Convention were critiqued as much. Due to his scandalous past, Clinton is on a careful watch. If it were not for his impeachment, people would likely not question what he was saying. So do you believe Clinton gave an honest and real speech? Or do you think his speech left out details that were necessary? “Tweeting” the Way (Back) Into the White House? Remember When… MTV Was Known For its Relationship to Music? I found this post interesting because I did not realize how closely his speech was being watched for factual information. At the same time, I think his past and reputation will always follow him because it was such a big, memorable event. Whether or not it was factual or not, Clinton has become an iconic figure, who people pay attention to both positively and negatively . I think a lot of the people tweeting and posting about how there isn’t much credibility in Clinton’s speech are incredibly uninformed on Clinton aside from his scandal. While his scandal was a big deal for the country and there were some lies said by Clinton, it is also important to look at his career as a whole. Aside from this one scandal I consider Clinton a honest and productive president who did a lot for our country. I believe he was a great person to give this speech for President Obama and I think the speech should have been taken as an honest speech from the start. I personally felt comfortable with what former President Clinton said. Whether he was completely honest or not, I couldn’t comment on. However, I did do some research on factcheck.org and they claim that with just a few exceptions, Clinton’s speech checked out, unlike both Obama and Romney who had plenty of “puffery” in their speeches. Perhaps because of all the accusations, Clinton and his team have to do some extra work on making sure the facts are straight, in order to keep him credible and well-liked. Personally, I have no problem with his speech being reviewed to make sure his facts were accurate. But in all honesty, I wish all of the speeches done during this time, with such a vulnerable audience, were reviewed. My problem does not lie with President Clinton and his speech specifically, because I, like a lot of America was able to look beyond the mistakes of his past. My problem lies with the outrage that came with reviewing his speech. I agree he should not be singled out, but I think this just brings to light the fact that we should not be trusting every word we hear from all politicians because they come from a place of “authority”.